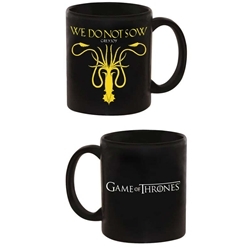 Our Game of Thrones Greyjoy Sigil Mug features the kracken of House Greyjoy. Also depicted above the kracken are the house words "We do not Sow". 11 oz. 4 Inches Tall.